Black Book and Fitch Ratings delivered seven key findings along with other projections as a part of its latest joint U.S. vehicle depreciation and auto asset backed securities (ABS) report released on Thursday. Black Book is forecasting an annual depreciation rate of 15% in 2019 as the supply of used cars and trucks increases, up from what editors called a “noticeably strong” 12.4% depreciation rate registered during 2018. • New-vehicle sales volume increased in 2018 to 17.3 million from 17.1 million in 2017. It was the fourth straight year where the industry sold more than 17 million new models. • Car segments constituted only 31% of the new-sales volume compared to 47% in 2014. • SUVs and pickup trucks are driving more new sales, while competition is heating up in these segments as more manufacturers introduce new and redesigned products. • After several years of declining prices, mainstream sedan segments saw a bounce up from the lows in the used market. With lagging growth in real income levels, affordability remained front and center, driving demand higher for used vehicles. • Prime auto ABS asset performance slowed in 2018 coming off peak 2017 levels, but ABS loss rates remain comfortably within Fitch’s initial expectations. • Fitch expects stable ABS performance in 2019 driven by healthy macro conditions and auto industry fundamentals, despite the increase in depreciation rates and marginal move higher in ABS losses predicted. • Fitch’s auto loan and lease abs rating outlooks are positive for 2019, consistent with 2018. Currently, Black Book’s base residual value models assume a GDP growth of 2.2 percent and jobs growth at an average of 160,000 per month in 2019. Black Book and Fitch are projecting good demand, but not as strong as in 2018, which was unusually high, spurred by tax cuts. “Weakness in home sales and volatility in the stock market could pose additional headwinds for the auto market,” experts said. “With growing uncertainty, it is important to consider the impact of alternative economic scenarios. Black Book’s scenario-based residuals, under Federal Reserve’s severely adverse economic stress test, showed a substantial drop of between 12% to 24% in used-vehicle values, depending on the vehicle segment. The Black Book Used Vehicle Retention Index also increased by 2.1% from 113.1 in January of last year to 115.4 in January of this year. Editors pointed out the Index has not seen this level of increase since 2012. During the months of May through September, the index demonstrated a strong lift, which Black Book acknowledged is unusual for that time of the year. After a strong performance in 2018, the index is projected to decline in 2019 as vehicles register slightly larger depreciation. “While the economy is expected to continue to expand in 2019, overall demand for cars and trucks may normalize,” Black Book executive vice president of operations Anil Goyal said. “In addition, we expect sustained high levels of supply of used vehicles in the market. As such, we are forecasting overall depreciation to rise in 2019,” Goyal continued. While prime auto ABS asset performance peaked in 2017 and slowed marginally last year, Fitch is expecting 2019 to be another year of solid performance against a backdrop of supportive macro conditions and auto industry fundamentals. Analysts noted auto loan and lease ABS rating outlooks are positive for 2019, consistent with 2018, reflecting stable asset performance and transaction structural protections. Fitch is predicting prime auto loan ABS losses to remain within its expectations in 2019, even as they slowly rise closer to 2005-2006 levels. Analysts said loss frequency will pick up this year, but severity should be relatively stable on the back of healthy-to-stable wholesale vehicle prices, as indicated by Black Book. Deleveraging transactions and building credit enhancement (CE) will support rating upgrades in 2019, according to Fitch. Fitch stressed that subprime auto loan ABS remains more vulnerable to performance volatility given weaker borrower profiles and acute competition. Despite this situation, the three subprime auto loan ABS platforms (AmeriCredit Automobile Receivables Trust, Santander Drive Auto Receivables Trust and World Omni Select Auto Trust) rated by Fitch are expected to produce loss levels within range of the firm’s expectations in 2019. 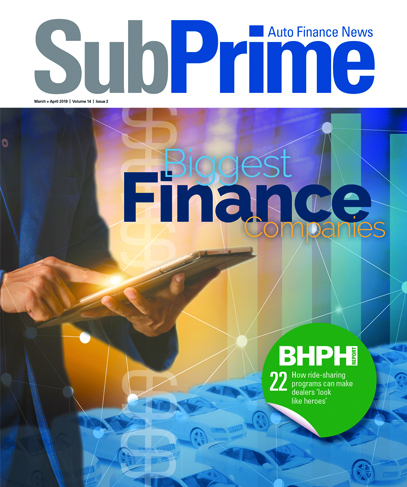 However, analysts caustioned the smaller, deeper subprime lenders’ ABS transactions — which are all not rated by Fitch — could be impacted and drive losses to record levels in 2019. “Consolidation of these lenders could pick up in 2019, particularly if sales remain flat and there is limited opportunity for growth, combined with intense competition, and executing ABS funding becomes more challenging,” Fitch Ratings senior director Hylton Heard said. “Further, servicing capacity and effectiveness will be a key focus if losses move higher in 2019, and will test systems and practices at these institutions,” Heard went on to say. The Black Book-Fitch vehicle depreciation report is available to download by going to this website.